"The Health and Safety and Wellness Committee is committed to providing support and resources to Members and their families in order to establish, build and maintain safe and healthy lifestyles." Get regular updates, news and valuable info – follow us on Twitter. CUSW's National Health, Safety, & Wellness Committee held their annual HS&W Conference beginning of November. Visit the Conference page for details. Check out the Health and Wellness playlist on the CUSW YouTube Channel! Learn all about the role of the Workplace HS Rep in this NEW one-hour on-line course! As we head towards an election year in CUSW, this course is very timely since one of the first elections of the year will be for your Workplace Health and Safety Representative. In this one-hour course, you will learn all about the role of the Workplace HS Rep as well as the skills needed and the duties required. Click here to read all the details! Dr Jonathan Samet, overall Chairman of the Working Group, indicated that "the evidence, while still accumulating, is strong enough to support a conclusion ... that there could be some risk, and therefore we need to keep a close watch for a link between cell phones and cancer risk." Download the WHO (World Health Organization) report summary here. The National Day of Mourning is marked every year on April 28. Why should we be pausing to remember those workers who have been killed or injured at work? The numbers tell the story. In the latest stats, 919 workplace deaths were recorded in Canada. This represents more than 2.5 deaths every single day across the country. "An agreement between Hydro One and it's Construction Trades] Unions concerning the engancement of the requirements of Bill 208 – An Act to Amend the Occupational Health and Safety Act for implementation at Hydro One." New Ministry of Labour (MOL) training standards for Joint Health and Safety Committee (JHSC) Certification take effect on March 1, 2016 and Ontario companies with 20 or more employees are impacted. Most companies in Ontario with 20 or more employees are required to have a Joint Health and Safety Committee (JHSC) that complies with the Occupational Health and Safety Act (OHSA). For most, that means having at least two committee members – 1 worker and 1 management representative – certified in health and safety. For more information, please email Howard Brown. CUSW's National Health, Safety, & Wellness Committee invites you to our HS&W Conference, Nov. 6 & 7, 2015. 8 am, Friday, Nov. 6 – 3 pm, Saturday, Nov. 7, at Humber College, Room #GH225 - North Campus, in Toronto. I am grateful and honoured to be allowed to share with you all, a tribute in remembering the Workers Day of Mourning. On April 28, every year, it is a time to remember and reflect on Workers that have died and suffered illness and disease in the workplace. We believe that every Member has the right to go home safe every day and that we are responsible for our own safety and wellness culture at work, and at home. Complete this course to learn more about the CUSW Health, Safety and Wellness Policy and, more importantly, come to understand the importance of every Member taking a proactive role in owning our safety culture. We have truly amazing Benefit and Retirement Plans! In this course, you will learn about the history of the plans as well as how they are managed by Members. You'll also learn how to access information about both plans through our on-line tools. Annual CUSW Health, Safety & Wellness Conference 2014. 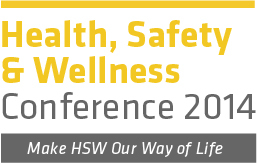 On behalf of the Canadian Union of Skilled Worker's National Health, Safety, & Wellness Committee, we invite you as a member to our Annual Conference on Friday and Saturday November 7 & 8, 2014 at the North Campus of the Humber College located at 205 Humber College Boulevard in Toronto, conference Room #T132. All Members of Canadian Union of Skilled Workers should be aware of a new Regulation under the Ontario Occupational Health and Safety Act ("OHSA") that requires mandatory training for Workers and Supervisors. The CUSW Health, Safety and Wellness Committee encourages all Members complete this online training. More details on the training here. "Safety is not a goal; safety is a long struggle with no final conclusive victory"
– presentation by EMC Power Canada Ltd.
Is your favourite vegetable a french fry? Do you have a fast-food breakfast? Do you find your energy fading by early afternoon? Is your biggest meal of the day dinner? Do you drink coffee, or pop more than water? ...Then watch THIS for some GREAT tips on how to keep your energy up all day, EASY breakfast and lunch ideas and lots more. This powerpoint presentation takes a minute to watch and could change your life! "... The Union brought a grievance challenging the mandatory random alcohol testing aspect of a policy on alcohol and drug use that the employer, Irving, unilaterally implemented at a paper mill. Fellow Brothers, Sisters, friends and families: I am grateful and honored to be asked to share with you, a presentation for the Workers Day of Mourning. • One goal is to pay respect to all those who have suffered on the job. • The other is to stand united in our commitment to improving working conditions and safety for all employees. We join together as workers, friends and families, all across Canada and around the world, in a minute of silence. A moment of respect that is denied or ignored by some employers. The WSIB reported for the year 2011 that 436 workers died in the workplace across Ontario and 240,000 workers suffered injuries, illness and disease. In reality these numbers are likely higher when you consider the number of incidents that go unreported or the number of workers that died from diseases, that were mistakenly not attributed to the workplace. • In the past not providing our members with fire retardant coveralls for their protection. • Incident investigation reports not being shared with our members so that we can discuss lessons learned and prevent similar incidents from happening again. • workers reporting their injuries, but the incident reports do not get documented. • Imposing a policy requiring workers to wear gloves 100% of the time in the workplace regardless of the task or risk of injury. • Imposing a policy requiring the wearing of arc flash / fr clothing at all times regardless of the task or risk of burns. • Failing to consult with employees or JH&S Committees before introducing new rules, policies, procedures, tools and PPE to the workplace. To this end, the Health, Safety and Wellness Committee and all the Health and Safety Reps and Stewards will continue to lobby for a safe and healthy workplace for all our members. Let's continue to remember those who were injured or died on the job each Day of Mourning in an effort to make all workplaces safer for all employees. We will draw knowledge from our past to strengthen our future. Please take a moment to remember a few of the CUSW members who have suffered tragedies recently: Steven Reilly, Norm Mcghee, Bruce Haliday, Albert Plouard, Pat Graham, Dan Plaxman, Wayne Mashke, Darren Christie. On behalf of the HS&WC, I encourage you to read the CUSW Health and Safety policy. • Fact Sheet, "Why We Need a Day of Mourning"